WHY WE LOVE IT: Similar to our Big Trouble in Little China comics, we're returning readers to one of our favorite—and most excellent—cult-classic properties with a new Bill &amp; Ted adventure of epic proportions. And because were fans first, were making sure it's something WE would read. Wyld Stallyns forever!<br />WHY YOU'LL LOVE IT: If youre a fan of the films, our comics will pick up where they left off. Main creative team Brian Lynch (Angel: After the Fall) and Jerry Gaylord (Fanboys vs. Zombies) bring you all the silly humor and likable characters mixed with some cool historical science fiction you love! Plus, each story will have a back-up adventure! This issue features a tale of tech terror by Ryan North (Adventure Time) and Ian McGinty (Bravest Warriors)!<br />WHAT IT'S ABOUT: Following the time-traveling historic epic of Excellent Adventure and the turbulent life and death of Bogus Journey, Bill and Ted must now fulfill their destiny as the inspiration for galactic harmony! How can someone hate the Wyld Stallyns as much as the evil Chuck De Nomolos? 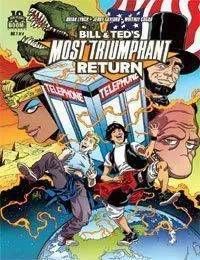 With the power of time travel, Bill and Ted set their sights on turning a young 27th-century Nomolos' non-non-heinous attitude into something most outstanding and metal!